Sorry about the delay, but it has been busy since the crew and I returned from Derby Day. To read part 1 and catch up with my Derby experiences from the rail, during the Derby race, and to read about my experiences surrounding Eight Belles, click here. 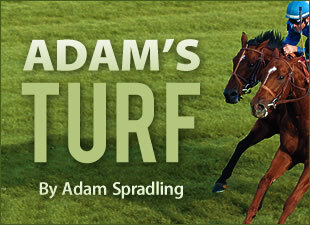 I am a turf fan, if you read my blog you know this by now. So you can naturally guess I was very excited about Einstein and the Woodford Mile. 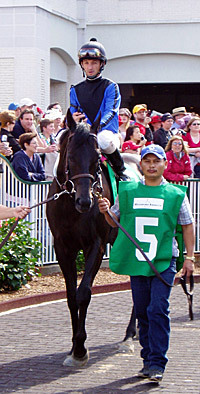 As a huge Einstein fan and saw his race at Keeneland against the turf king, Kip Deville. I watched all the competition in the paddock, but Einstein was just looking great. A beautiful horse with that tongue action going on. Pyro, Tiago and so many others just enjoy that tongue sticking out. I will write a later blog on that. I had media credentials and wandered across the dirt track to watch the race from the turf-side rail. Meaning I was right at the turn, just past the finish line. The area might be better known as photographers alley, which I did meet a lot of great photographers. 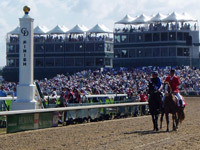 The starting gate position allowed the horses to pass by twice, once as the exited the gate and then twice as they crossed the finish line. Both turns allowed me to be closer to the action than I have ever been before. I felt the wind as the Woodford field romped by and felt the ground shake as the strides hit the ground. It was one of the greatest experiences and who knows when or if I will receive that opportunity again. Read about Einstein and the race here. 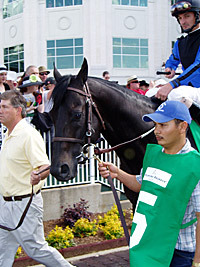 The previous day, Oaks Day, I called horse number five to win in the Alysheba. Why you ask? Because he is a Giant's Causeway and yes, he won on dirt! Well, it was slop, but still, I called it. Giant Gizmo's name is what sold me, but the numbers on the page looked great as well. 'Gizmo's history at Churchill Downs and on wet dirt tracks was a good indicator that he would have an advantage over his competition. Of course I had to go put him in an exacta and not go with my gut bet on him to win. I need to get out of the exacta habit. 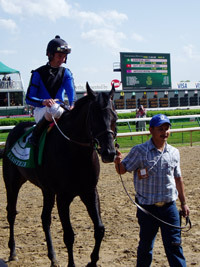 None the less, I say this was a defining moment as a great handicapping sucess. Read more on Giant Gizmo's brilliant race here. The first race of Oaks day and several other races throughout Friday and Saturday held many good strides in my handicapping knowledge and gain. I have to give a shout out to Jason Shandler for some of his help in that growth of racing wisdom. Among the races were lots of celebrities, and I saw most of them. I was able to work the red carpet and was thrilled to see several people in entertainment. Of course the A+ lister was Hef and his ladies, but seeing Lennox Lewis, Fred Willard, Greg Grunberg, Smoky Robinson, Dr. J. and several other celebrity/reality/sports stars was a blast. I have never had that experience before and do not know if I ever will again. Watch the entertaining sights and sounds of the red carpet from Derby Day here. Now they are not quite red carpet celebrities, but people who wore crazy hats entertained me almost just as much. It just seems like there was something everywhere. It was an experience that was a blast. 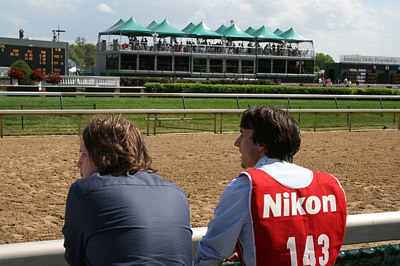 The most fun, hands down, was watching the races on the rail and having access inside the paddock for the week. It was amazing. Derby Sights and Sounds Photo Gallery by Robert Bolson.